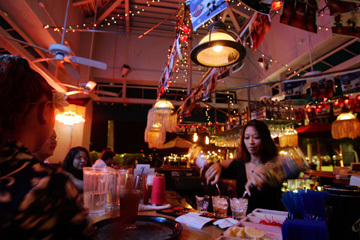 Kapono's at Aloha Tower Marketplace will close for good in the wee hours of 2006. It won't be until after a New Year's Eve bash that will be recorded for release on DVD and a live concert recorded for CD, but the lease expires at the end of the year and the three Kapono's partners decided not to renew for another five. Kapono's restaurant and nightclub opened in the Aloha Tower Marketplace in June 2001 in the space vacated by the Pier Bar, which the recording artist's company had owned but not operated. Kapono said then that he had been thinking for decades about opening a club like some of the best places in the world where he had performed. "The only thing I feel sad about is that we have such a great staff. The crew, the team of people that has been working for us, some for quite a while ... have really helped us to turn the place around and really make it happen," said Henry Kapono Ka'aihue, namesake and partner in the restaurant, bar and concert venue. "Making that decision was hard, based on the fact that we'd have to let these people know." The restaurant and nightclub employs about 30 people, "the best of the best," said Lezlee, his wife and business partner. "We are going to do everything they can to help them (find new jobs). Once they identify where they want to go, we're going to help them get there," she said. Otherwise, the Ka'aihues and third partner John Bilgrave feel good about the decision that parent company Lokahi Elua Corp. needs to move on. "Having such a large and beautiful outdoor space can work for you, and it can work against you in a lot of ways," Lezlee said. "Aloha Tower has been supportive of us, but it is a difficult location to do what we had in mind to do." Entering into another five-year lease was a huge commitment, and the partners felt that not all the parameters they needed would be in place, she said. The decision not to renew was not a surprise to Aloha Tower Marketplace management. "We're in good communication with them," said General Manager Floyd Williamson. "We're going to miss them a lot." The restaurant and club "had taken a new direction for new events that they brought onto the property," and had had an especially good year, he said. Marketplace management is in lease talks with another potential operator that Williamson declined to identify. Bartender Lisa Rapal mixes drinks behind the bar at Kapono's. The restaurant-club's owners say their 30-some employees, "the best of the best," will get help finding new jobs when the venue closes on New Year's Day. Kapono will focus on his music, performing, traveling and recording, specifically an album titled "The Wild Hawaiian." "I've been working on it for seven years, trying to design something that I think would be worthy of introduction to a new audience," he said. Kapono is accustomed to biding his time to see something to fruition. When his club opened in June 2001, he told the Star-Bulletin, "I pretty much had this vision 20 years ago, because I played in some of the greatest places in the world -- places that you want to play whether you get paid or not, because you sounded good, you looked good (and) people enjoyed themselves. I wanted to build a place like that where a local artist can be empowered by that kind of vibe." In a statement prepared Friday, Kapono said, "Today, I am so proud of what Kapono's has become. I am honored to work with such a professional and hard-working team of managers, employees and musicians. I am equally honored to meet and spend time with our customers." The Ka'aihue-Bilgrave-Aloha Tower connection started 11 years ago. The company previously owned the Pier Bar, but it was an investment and they were not operators. Approaching the last year of the lease, the company had been toying with the Kapono's concept and had looked at various locations, from the old Canlis building and Niketown in Waikiki to the historic pump station in Kakaako, Lezlee said. None of those deals panned out. By that time, "the lease was rapidly coming up for the Pier Bar, and one thing led to another," and the decision was made to open and operate Kapono's starting in June 2001. The partners built the business from the ground up, saw it begin to flourish -- and then came the Sept. 11, 2001, terrorist attacks. "We literally saw our business cut in half overnight," Lezlee said. Like most other local businesses, Kapono's struggled but survived. "From the start I was amazed at how supportive not only our family and friends were, but also the Honolulu community at large. So many generous people helped us in so many ways to make Kapono's a reality," Kapono said in his statement. The phrase "We always overcome," which Lezlee attributed to General Manager Jose Bayani, became the company slogan, she said. The venue has hosted as few as 100 guests on a normal night to standing-room-only crowds of 3,000 for fund-raisers, CD release parties and concerts featuring local and mainland acts. On New Year's Eve, Kapono's last day of operation, "we will capture everything live, from start to finish, on 'Live @ Kapono's,'" Ka'aihue said. The final day will be taped from early morning until midnight fireworks and closing, for eventual release on DVD. "We really want to make it a celebration," Lezlee said. That night, a live concert featuring Kapono and guest artists will be recorded for a CD to be titled "Henry Kapono Rocks Live @ Kapono's." If there was one thing he could say to each customer, fan, fellow musician, employee, purveyor and vendor, it would be, "Thank you for the good times, and the best is yet to come," Kapono said. There might be a song in there somewhere, he said with a laugh.